This page is dedcated to the wonderful people that have helped the History in Your Hands Foundation take shape and begin to flourish. Thank you for all you have done to not only support the mission of our organization, but to better historical education itself. As a fellow history lover, Owen was generous enough to provide us with an existing collection that he himself curated. Producing two books on the subject of biblical artifacts and coins, his collection was utilized at his local Church as a learning tool. Inspiring the young people in the surrounding community to not only learn about the items, but also reproduce several clay objects themselves. We would like to thank Owen for passing these wonderful pieces along to us so that they may continue to educate students for years to come! 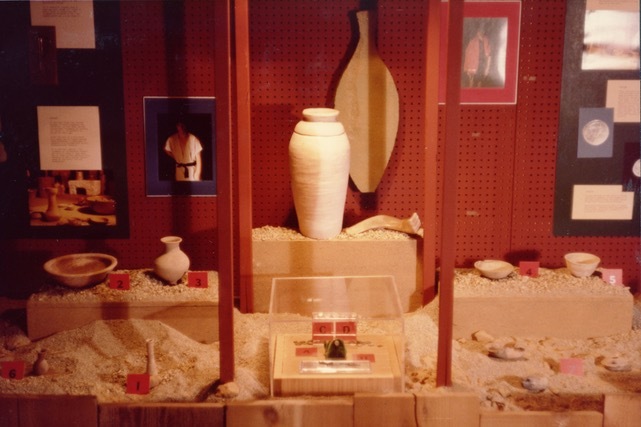 Pictured left: A snapshot of a display case set up in cooperation with The Bader Institute, provided by Owen Guy.